Since my arrival in Las Vegas on May 1st, 2017 my primary project has been to start a catalog of outdoor activities that the city of Las Vegas offers it's local residents and visitors who care to venture off of The Strip and out of the casinos. I have now visited 5 city parks and hiked City View Trail. It has purposely been a slow start on this project because of the heat and because getting settled into a residency here in Las Vegas is a major project. 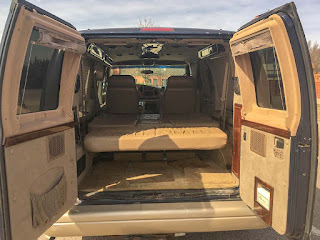 Here are photos from 3 of the parks that I have visited. 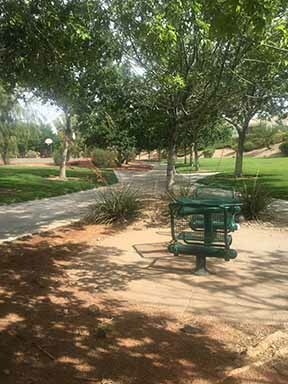 Vivaldi Park, Sonata Park and Pucinni Park are all connected by Seven Hills Trail. This trail is a 2.5 mile loop trail, but there are side trails that take you through the surrounding neighborhoods. All of the trails seem to be paved. The "All Trails" web site says the trail are good for all levels, but I have learned quickly that even the ease of any path depends on your stamina. Keep a bottle of water with you. To get to Seven Hills Trail and all three parks take the St. Rose Parkway to Seven Hills Trail Drive. Turn right onto Seven Hills Drive and stay on it. You will see the entrance to Vivaldi Park on your right. Continuing on you will find Sonata Park on your left, and finally Pucinni Park is on your right just before Seven Hills Trail Drive ends in a "T" with itself. It seems that almost 3/5 of Seven Hills Trail slopes fairly gently upward, 1/5 of the trail is a steep climb, and 1/5 of the trail is that downward slope that you always wanted to ride your bike down when you were a kid, so hang on and go for it. One last item: You can start your walks at any of the three parks. They are all interconnected. And, you can do what I have done by taking 3 separate days to visit three separate parks. 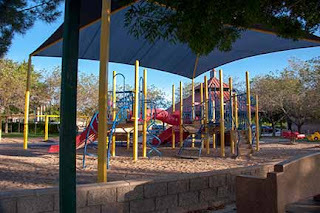 I now plan to return to these parks and start taking the trails that extend out through the surrounding neighborhoods. This scene is from the adjoining neighborhood to the east of Vivaldi Park. I clicked this photo as I exited the site on my way home. 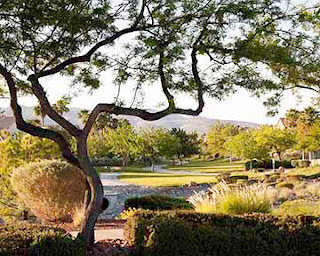 The park has fantastic views of the city of Las Vegas, Henderson Executive Airport, and the mountains that surround Las Vegas Valley. Sonata Park would, I think, be the smallest of the 3 parks. It's major points of interest is the large grassy field and this children's park. When the day is done this park is well used by locals of the neighborhood. Pucinni Park was the real surprise for me. At every turn there is something new to discover. It was sometimes hard for me to decide which direction to walk. I finally realized that there will be several returns trips to all three of these parks. They are within 3 miles of my home. 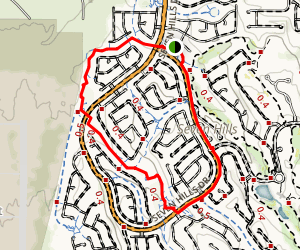 This, in the red, is Seven Hills Trail. Seven Hills Drive is the gold road that loops back into itself. The green dot is Pucinni Park. Following the red line to the left of Pucinni Park will eventually take you to Vivaldi Park in the area of the two red dots that are close together. In figure #1 you can see the trail (in red) after the trail crosses Seven Hills Drive as it continues southeastward and hooks up with Seven Hillls Trail Drive. This is where the steep hill begins. But, the downhill side is a refreshing walk.